A little girl plays happily with her doll. As she pours an imaginary cup of tea, a boy enters the room, steals the doll, and walks out of the room leaving the girl in tears. Twenty years later, when a justice of the peace is stabbed violently after performing a wedding ceremony, police hunt for his killer. 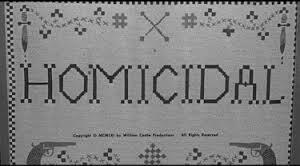 William Castle’s answer to PSYCHO, HOMICIDAL, tells a neat story of family expectation, mental illness, and murder. 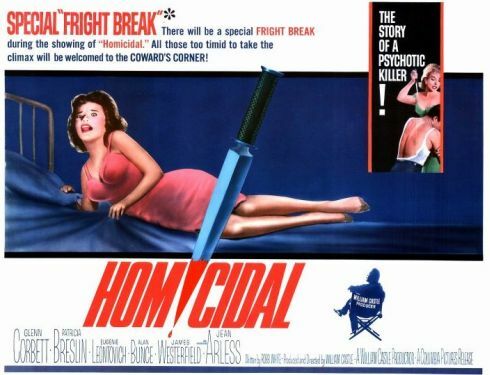 Without giving too much away, I’ll say that HOMICIDAL is a fun film and the first to include a fright break. One of Castle’s legendary gimmicks, the fright break guaranteed the film-goer a refund if he was too scared to stay until the end. 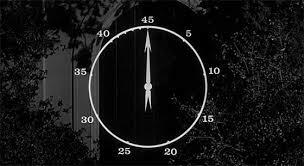 A forty-five second timer appeared onscreen right before the climax of the film allowing the faint of heart time to exit the theatre. When Castle found that one percent of the patrons were asking for refunds, he instituted a Coward’s Corner, a yellow kiosk in the theatre lobby. To get there, scaredy-cats had to walk up the aisle lit in yellow while a recording bellowed, “Watch the chicken!” At the Coward’s Corner they had to sign a card that read ‘I am a bona fide coward.’ The combination of the audience’s ridicule and the signing of the coward card put an end to Castle’s refund troubles. As gimmick-ridden as this film and many other William Castle films are, they’re still well made and entertaining as hell. The black and white cinematography by Oscar winner Burnett Guffey looks wonderfully sharp and Hugo Friedhofer, another Academy Award winner enhances the mood with his score. Patricia Breslin and Glenn Corbett lead a tight cast of character actors and it’s fun to guess what will happen next. HOMICIDAL’s charm lies in its over-the-top story told with a straight face. 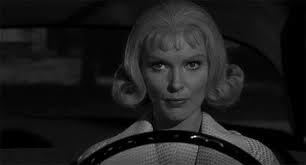 The actors don’t smirk at you like Dean Martin does in a Matt Helm vehicle. They’re serious. I like HOMICIDAL more than I probably should. Catch it if you can. I have the same sampler in my kitchen. Psycho with charm? That’s Castle for ya! I need to see more of his movies. Have you seen Shanks? I believe it was his final film but it stars Marcel Marceau in a bizarre fairy tale about the dead brought back to life through a remote control. It’s wild! The Tingler, Strait-Jacket, and Mr. Sardonicus are also excellent Castle films. No, I haven’t seen Shanks. Thanks for the recommendation! Thanks for reading too!